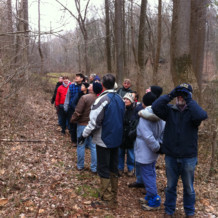 What a lovely winter bird walk this morning in Glen Providence Park! We had a fun group of people, with a turnout of 22(! ), including both new and veteran birdwatchers. It was a cold and overcast morning, and the birds were hiding- but led by Al Guarente of the Birding Club of Delaware County, we started off with the Great Blue Heron and identified 21 species. And with the addition of the Black Vulture sighted today, our 2012 Birding Big Year count is up to 35! It was a good thing Al Guarente was leading the walk, as he identified those birds that were heard and not seen, such as the Red-winged Blackbird– you can learn its call on allaboutbirds.org. Al also shared his humorous philosophy on the birding technique pishing: It does one of three things: it either flushes them out, scares them into hiding, or does nothing at all- but it’s worth a try! Not surprisingly, we saw most of the birds along the Shingle Mill Trail: including pairs of Red-bellied Woodpeckers and Northern Cardinals, a female Eastern Towhee, and a White-breasted Nuthatch… our complete list is below. Some uphill scrambling, interesting trees, pretty views and good conversation rounded out the morning. The bird walk continued at the Millenium Trail, just south of Glen Providence Park. A big thank you to Al Guarente, and to everyone who came out this morning for a lovely winter walk! Interested in more bird walks? Check out the Birding Club of Delaware County’s field trip schedule!